You’ll be able to join the Club or renew your membership. Members receive the 52 page, glossy Summer 2013 issue of the Club Magazine, which includes a fine array of topics….Mike "Nibbo" Niblett relives his first TT experience of last year as do the brother sidecar pairing of Mark and Lee Saunders, who amazingly only got together part way through practice week. IoM Motorsport Manager, Paul Phillips gives frank replies to our questions, Brandon Cretu adds an international flavour as do Dutch riders, Michael Hofman & Peter Heijmans who began their IoM road racing journey by entering last year’s MGP. The Magazine continues to follow the progress of Ivan Lintin, who, after achieving success between Irish hedges, is now in with a serious chance of securing a TT podium. 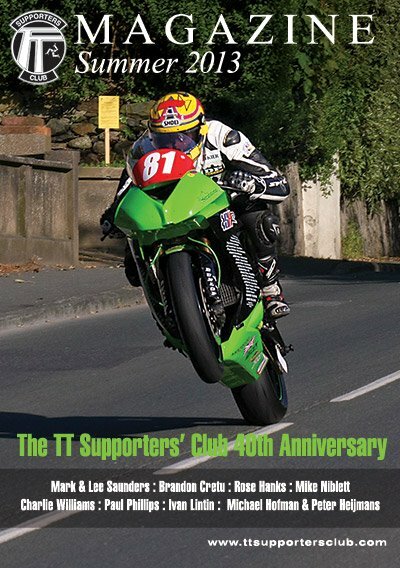 A more poignant article, perhaps, concerns Club President, Charlie Williams, sadly not at he event in an official capacity this year, who looks at how the TT is ‘now moving with the times’…and, finally, we look at the achievements of one of the jewels in the TTSC crown - Rose Hanks, our Club Secretary, who was the first lady competitor to step onto the TT rostrum. The Riders Draw will be held live on Radio TT - six prizes are up for grab - £350, £250 and four of £100. The Club is hopeful of continuing its physiotherapy service for competitors. 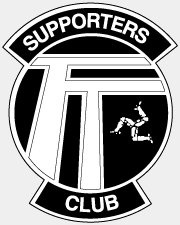 The Susan Jenness Trophy - awarded with respect to the most meritorious performance, in the eyes of the TTSC Executive Committee, by a female competitor in the TT - will be presented to Debbie Barron, for her fantastic efforts in last years event. It is hoped that Mick Jenness will be on hand to present the award which is in memory of his wife, Susan who lost her life whilst marshalling a UK off-road even some years ago. Who will be the deserving recipient for TT 2013? Riders in the two Supersport races will be vying for the TTSC Trophy - a silver tray on a plinth. Cameron Donald is currently in possession of the trophy, awarded for the lowest aggregate time across the two Supersport races.